Watch out for that sign up ahead! You know what I’m talking about: Men at Work. 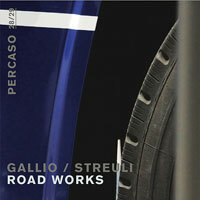 More specifically, it’s Road Works, the fourth album by the two men Christoph Gallio, a composer, and Beat Streuli, an artist. Written for sax, piano, synth, double bass and drums, Road Works, despite its plural name, is actually one long work divided up into 72 extremely short tracks that range from 13 blinks of an eye (13 seconds) up to almost a pop song (a whopping 2:07). The material seamlessly moves from pensive chamber jazz to field recordings of birds and dogs barking to upbeat jazz rock to melodic sax with synth drones to quiet stuttered electronics to cool melodic jazz to more field recordings combined with prickly improv to free jazz screams to drones with tinkles to melancholy piano ambience to free drum / fart synth workouts. My favorite part is the cool jazz with a gentle thunderstorm crackling in the background, which is an obvious yet perfect combo. Overall, Road Works is quite a quirky, fun little album chock-full of interesting aural nuggets suitable for fans of jazz and experimental music alike. Note: This package also contains a DVD, but unfortunately, it would not play in my laptop. You are currently browsing the Arcane Candy weblog archives for May, 2014.